Labour leader Ed Miliband has revealed details of 43 meetings and dinners he has had with union bosses and donors who have given Labour more than £7,500. Lord Sugar and Ken Livingstone are among those included on the list. 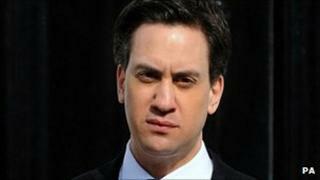 Mr Miliband has met Unite union boss Len McCluskey eight times since 2010. David Cameron published details of private dinners at No 10 for Tory supporters who gave more than £50,000 after a row over alleged "cash for access" to senior ministers. He came under pressure to release the information after former Conservative Party Treasurer Peter Cruddas was filmed suggesting big donors could get access to dinners at 10 Downing Street with the prime minister and gain influence at No 10's policy committee. Mr Cruddas quit after making the remarks and the Conservatives launched an inquiry into their procedures for handling donations. The list of Mr Miliband's engagementssince November 2010 - which he promised to release earlier this week - is dominated by meetings with trade union leaders, whose members all contribute money to Labour. As well as Mr McCluskey, Mr Miliband met Unison boss Dave Prentis and GMB boss Paul Kenny on several occasions as well as Billy Hayes, who represents postal workers, and the leaders of the USDAW, TSSA, UCATT and Community unions. Businessmen featuring on the list include Labour peer Lord Alli, George Iacobescu - head of property firm Canary Wharf - and Henry Tinsley, former chairman of chocolate makers Green and Blacks. Among those to have had dinner at Mr Miliband's house are Ken Livingstone, the Labour candidate for mayor of London and Andrew Rosenfeld, the property tycoon who is one of Labour's largest donors and is advising the party on their fundraising activities. Mr Miliband had "gone further" than the prime minister in disclosing the full extent of his links with key financial supporters, Labour said. "We promised openness and transparency and we have delivered," a party spokesman said. "David Cameron should match this by publishing his own list of all meetings and dinners with donors who have given more than £7,500." But the Conservatives hit back, saying Unite had donated £5m to Labour over the period in question or "£630,000 for every meeting and dinner" between Mr McCluskey and Mr Miliband. "This is damning proof the Labour Party is the political wing of Len McCluskey's Unite trade union," said Conservative co-chair Baroness Warsi. David Cameron's list revealed he had hosted three dinners at his private Downing Street flat since becoming prime minister, welcoming a number of prominent party backers, as well as a post-election reception at No 10. Mr Cameron said he had paid for all of the dinners himself and he had known most of those attending for many years.